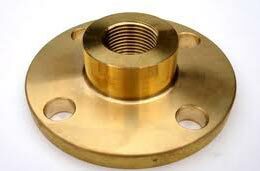 We bring to you a comprehensive range ofÂ Copper Alloy Flanges. For over a decade now, we have been a dependable Manufacturer, Exporter, Importer and Supplier of Copper Alloy Flanges from Mumbai. Out stock comprises Copper Alloy Flanges in several grades and specifications. Quality is of paramount importance to us and we never compromise on this aspect. With state-of-the-art manufacturing facility and strict quality testing procedures, we supply products that achieve highest levels of client satisfaction.Â Our flanges are subjected to stringent quality tests so as to eliminate each and every possibility of defect from them. Obtain from us, small as well as bulk quantities of flanges at the most reasonable prices.